Yes, it's anniversary time again. This year it's big one for us....two digits with a zero at the end. No, I don't want to date us by telling you how many decades we've been married. Anyway, it's been a colorful, happy life together so I wanted this card to reflect that. 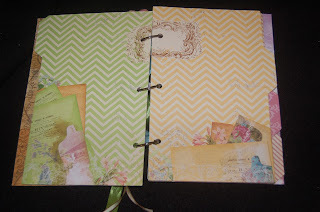 I started with a card stock from the Classic pack by the Calico Studio company. 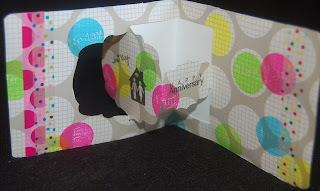 I was anxious to break out a new Sizzix die, Label Window 3-D Pop-Up, which I purchased from Ben Franklin Craft store. Combined with the Sizzix card base die, this die did most of the work for me. 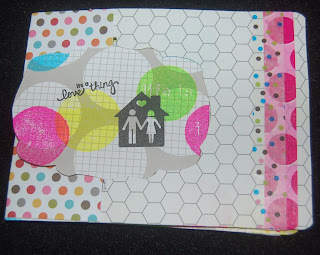 All I did was add some neon colored dots with Hero Arts Clear stamps from the Stamp Your Story set using Neon ink pads. Black ink was used to stamp the words and house with figures which came from a Studio G set. The card was finished off with washi tapes to add more dots and color. 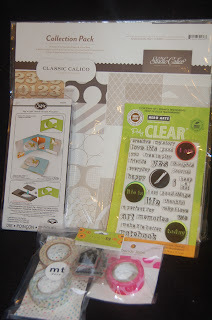 All the supplies were purchased at my favorite craft store, BFC! This card was easy and fast to make.....hope he likes it....but shhhh! our anniversary is not until the 12th. 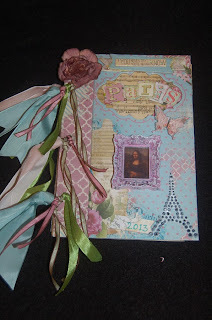 I love the Bo Bunny C'est La Vie line of products so it was a no-brainer that I had to use some of those supplies to create my Paris trip album. 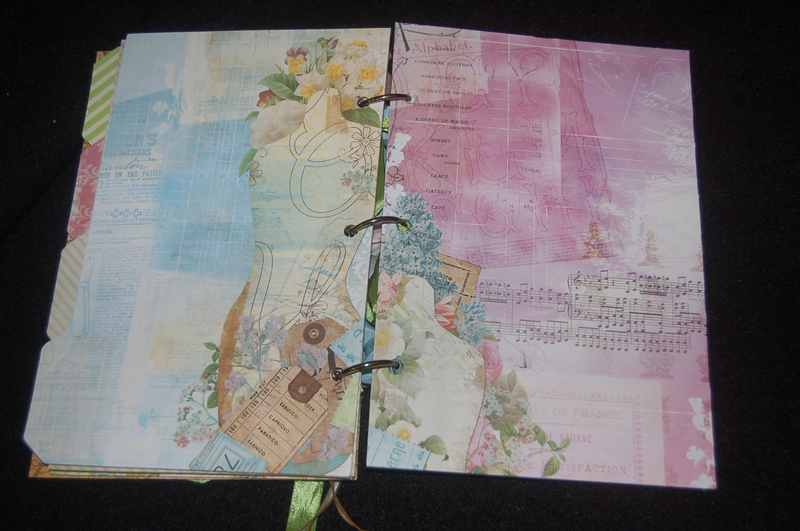 The album base that I chose was a chipboard one with metal rings for binding. The large rings allow for adding thicker inclusions of memorabilia and photos, but the rings are not attractive to me so I tied ribbons on them as a camouflage. For a focal point, I painted a Sierra Pacific picture frame magnet (that I purchased from Ben Franklin Crafts) with Vintaj metal enamels and white acrylic paint. In the picture frame I positioned a photo that I took of the Mona Lisa painting at the Louvre in Paris. 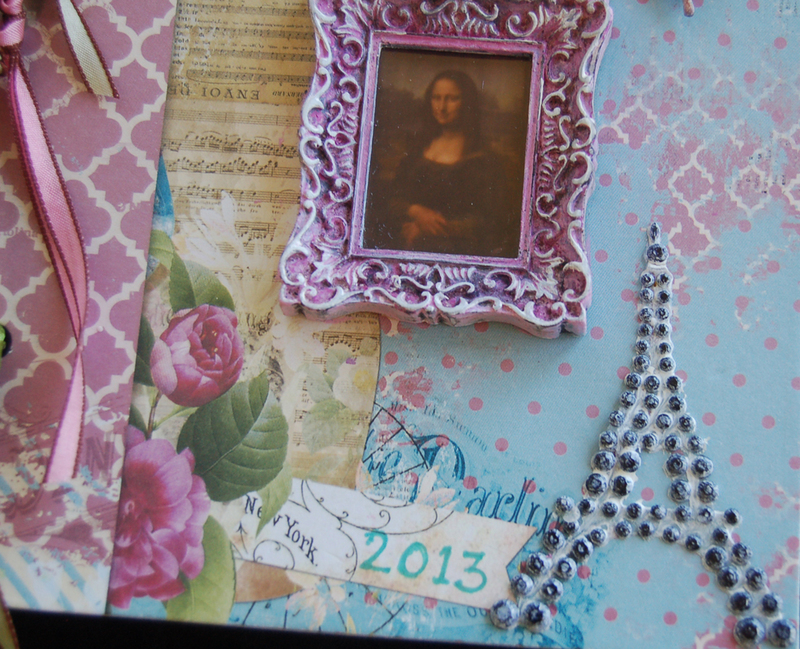 The Eiffel tower rhinestones were shiny black so I toned it down with white acrylic paint. The large rose was originally a cream color but I saturated it with Distress inks to obtain a richer color. The letters that spell Paris and the butterfly were from a K and Co. chipboard set. Some of the letters and the butterfly were not the right colors so I altered them with Tim Holtz white crackle paint and a distress ink pen. The Bo Bunny chipboard banner at the top of the album was also altered and distressed to better match the look I was trying to create. The blank album is on the left. Notice the large metal rings. 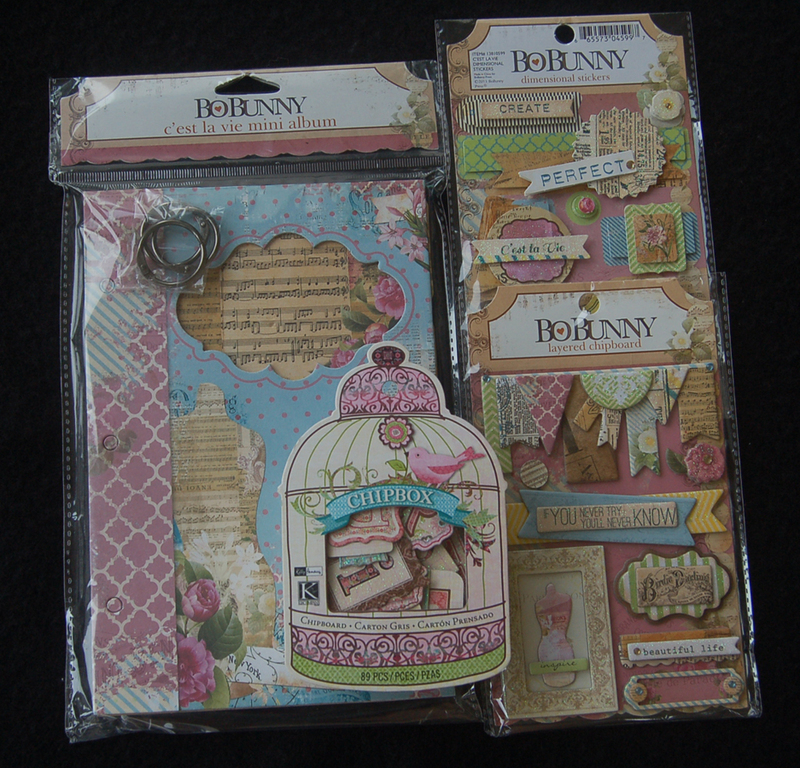 It's amazing how well the K and Co. chipboard alphabets (in bird cage box) match the Bo Bunny C'est La Vie items. 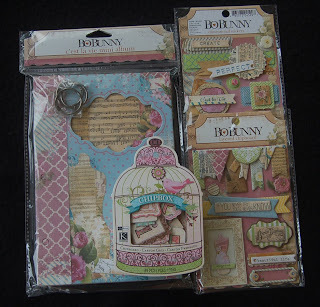 The chipboard stickers are so pretty and will easily fit in the album because of the large metal rings. 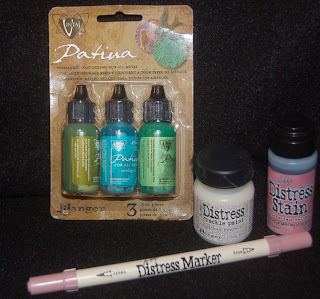 In this photo are the distress marker, dauber stain and crackle paint (Tim Holtz line probably purchased from Ben Franklin Crafts) that I used. The Vintaj Patina metal enamel paints (not the colors I used on this project) were purchased in the jewelry department of Ben Franklin Crafts. 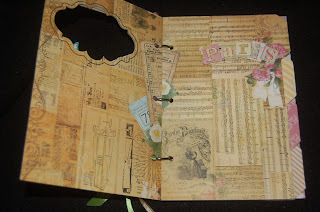 I hope these photos and explanations help you to see what you can do with the Bo Bunny chipboard album. 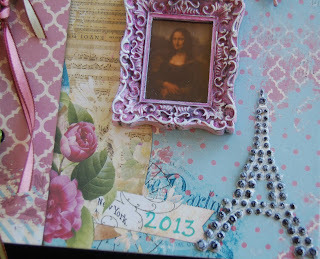 I had lots of fun playing with the supplies to get just the right look for my Paris album. I may add more ribbons, the ones I purchased in Paris would be apropos I think. Okay, that's it for now. I hope this post didn't have too many photos LOL! Have a crafty week! Over the years I have made many versions my mother's banana bread and usually tasters ask for the recipes. As the years roll by I have become increasingly aware of the need to change some of those recipes to healthier versions. My main health enemy seems to be sugar and I've heard that here in the islands high blood sugar is a definite problem. I also would like to incorporate more non-wheat carbohydrates into my baked goods. With these two concerns, I began altering my mother's recipe. I did not change the butter amount because I like the taste of real butter, but if you have a cholesterol concern by all means use another low cholesterol type of fat. The heart shaped muffin was made in a Wilton silicon cupcake baking mold purchased at Ben Franklin Crafts. I hope you'll try making this healthy recipe for your love muffin. Cream the butter and sugar. Add the bananas and beaten eggs. Mix in the oats and flours. Sift in baking soda and salt. Fold in the chocolate, pecans, and cranberries. Spoon the dough into a large loaf pan, several smaller loaf pans or a 12 cup muffin tin. Place the pan(s) in a cold oven and set the temperature to 350 degrees and bake until a knife inserted comes out clean (about 20 minutes for muffins and 1 hour for loaf). Tip: Toast the pecans in the microwave on high at 10 second intervals. You know how sometimes (but rarely) you imagine a piece and then it turns out exactly as you imagined or sometimes even better. Finishing this resin project was one of the those rare moments when all the stars lined up and I achieved what I wanted. 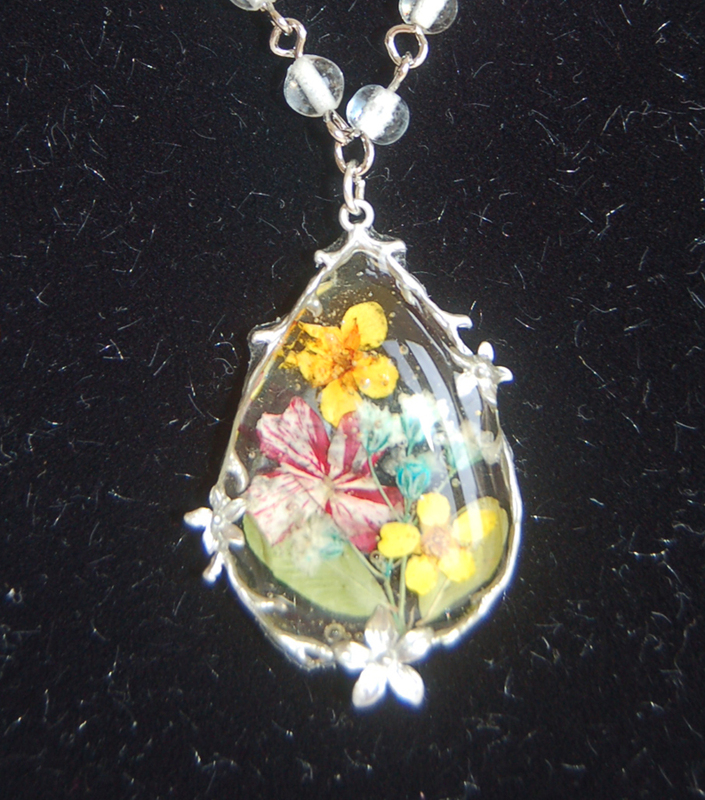 I am so proud to show you my UV resin pendant made with real pressed flowers set in a teardrop metal pendant frame. 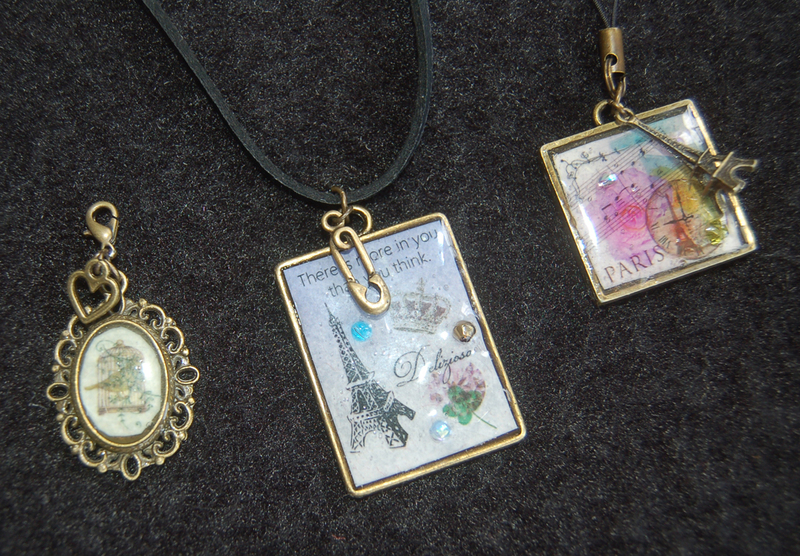 The pendant frame, UV light and resin are available from Ben Franklin Crafts so you can design your very own original jewelry like this. To make tiny pressed flowers and leaves I suggest you dry flowering herb plants between white paper and leave them under heavy books for a few days. This close-up shows the delicate and colorful the petals and how the flowers are set perfectly in the resin. The beaded chain and dainty Japanese clasp were found in the Ben Franklin Crafts jewelry department. For a while I will suspend showing my resin crafts on this blog site (so you paper crafters won't get bored), but I have so many ideas to try that I'm sure I will show you more later. Jewelry magazines and books abound with creative steampunk style work and if you like the look, I think you will be drawn to the possibilities of resin crafting. I hope you'll check out the new merchandise at BFC and become inspired. As you can see, I took a little break from making resin pieces to make a B-day card for a cat lover. 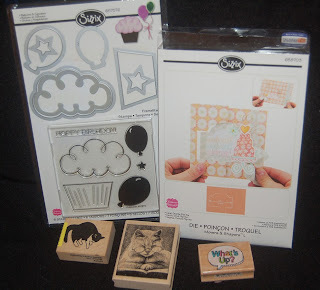 I only had two cat stamps...really got to go to Ben Franklin Crafts and get the new cat stamp by Sister Stamps. This big cat with glasses is by Stampendous and G Studio makes the 'What's Up' stamp. I love making, sending and receiving interactive cards so the base for this card got me excited because it was well designed and had lots of possibilities. It was made using a Sizzix flip-its die purchased from Ben Franklin Crafts. The polka dot star was a leftover from another Sizzix die project and the balloons were cut from scrap using dies from a Sizzix die/stamp birthday set. Pop-up foam dots were put behind both cats and the balloons. As you can see I was able to include another resin piece. This charm pull was made using a clear plastic charm and includes a mini transparent cat sticker and some stars which were embedded in the layers of resin to appear as if they were floating. All parts (except sticker) were purchased at BFC. 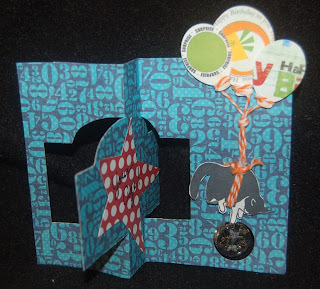 This cat charm pull was taped behind the card so that it dangles through the punched hole in the card. Here are the main supplies used for this card. 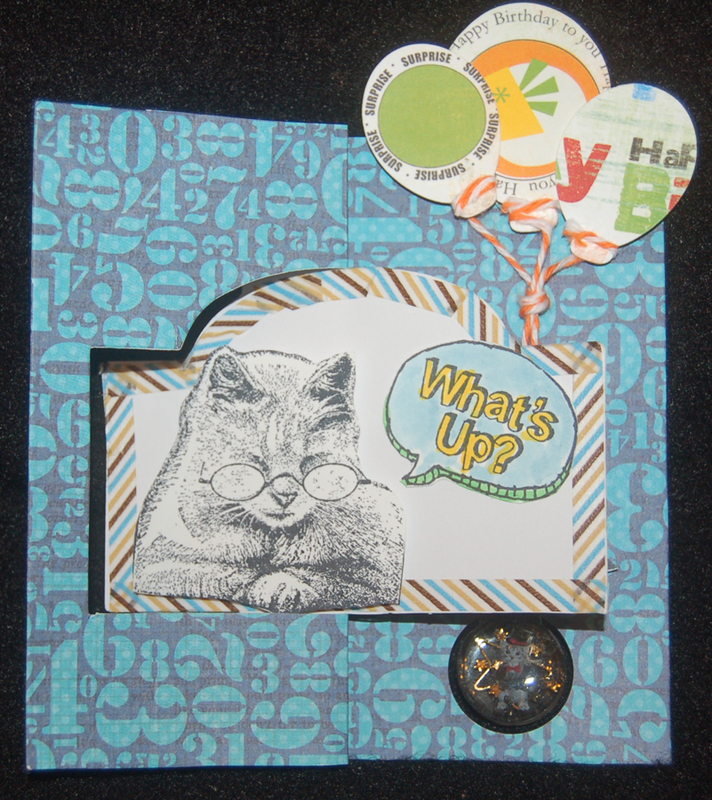 The smaller cat stamp is from Hanko Designs. 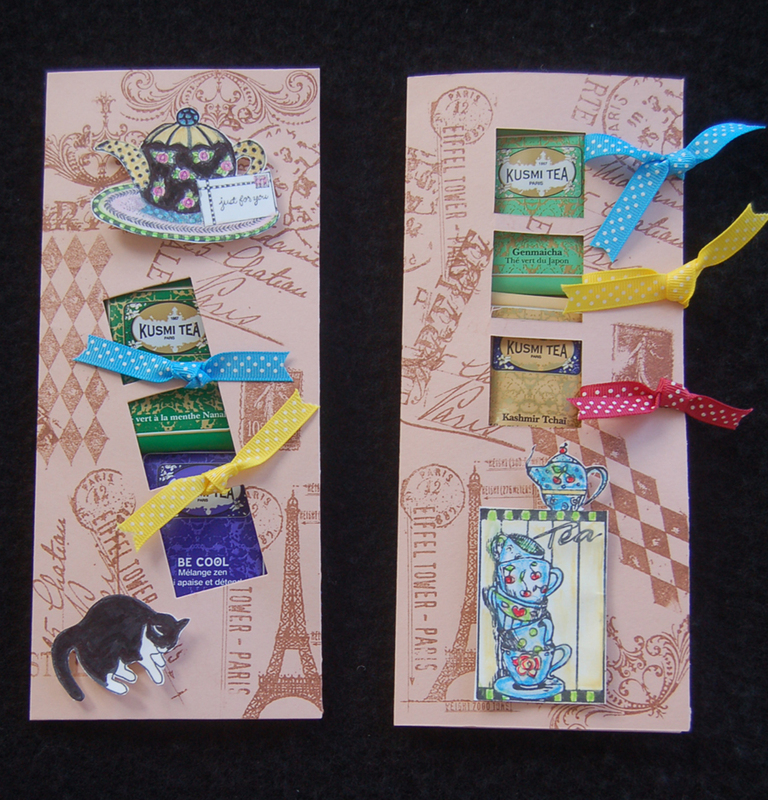 Oh, the striped design around the bigger cat in the front of the card was made with skinny washi tape. On the right hand corner of the card die packaging you can see a sticker indicating that the package contains a talking sticker. I applied the sticker to the back of my card so that the recipient could hear a personally recorded birthday message and my card became even more interactive. If you and the person you send a card to have cell phones with the app feature, you can make your cards extra special too. 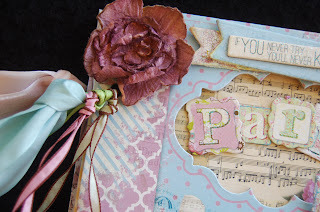 I had so much fun designing and creating this card that I had to share the outcome with blogland. I hope you enjoyed seeing and learning about this cat lover birthday card. Please come back soon to see more of my creations and perhaps learn some useful information. Happy Crafting! As promised, here are more examples of UV resin projects made with the kits available at Ben Franklin Crafts. 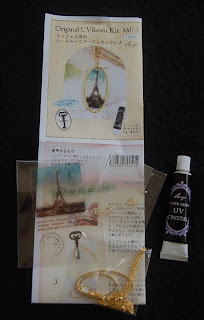 These three kits (there are others available) are similar to other resin-like crafts done with Crystal Lacquer or other slow drying liquid mediums except that with the UV light to harden the resin, results are achievable in about 10 minutes and several layers of images can be added as desired. I didn't follow exactly the suggested layout of the images and 3-D objects and sort of mixed/matched the acetate pieces to create a piece that was more to my artistic taste, truly making each piece a one-of-a-kind. Here are the UV light and UV resin solution. 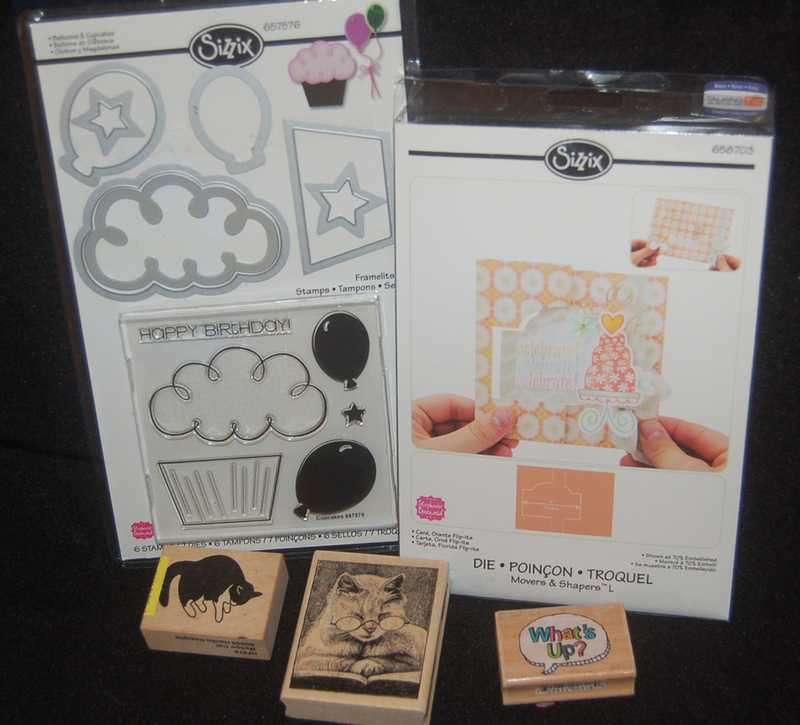 Both are available at Ben Franklin Crafts and necessary to make these kits which do not include the resin. 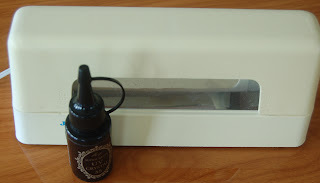 Some of the kits do have the resin included. I was very satisfied with the results from these kits and even though the instructions are in Japanese, you should have no problem completing them. Tips: 1)Small scissors will be needed to cut out images. 2) A bamboo skewer is useful for positioning images. 3) Clorox antiseptic wipes are great for clean up. and 4) Jewelry pliers are needed to open the jump rings to assemble the pieces. I hope this post has encouraged you to try making some pretty resin crafts for yourself or a friend. Happy Crafting! On a recent shopping trip to Market City Ben Franklin Crafts, I was elated to see these new jewelry kits and jewelry components from Japan. 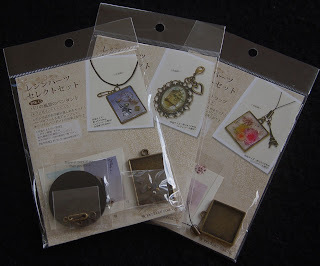 I had the opportunity to try out this new jewelry craft while visiting a Japanese craft store a year ago, so I knew this was a great craft product. This particular kit contains two oval rings, clear acetate images, jewelry findings and liquid resin which sets with a UV light. The process of making these pendants is simple and the easy Japanese instructions will shortly be translated and available at the store. Here is what you get in the kit. There is enough resin to make both pendants and perhaps another smaller one. First the oval ring is pressed onto a piece of wide cellophane tape (not included). A little bead (included in the kit) is also adhered to the tape within the ring. A little resin is dropped into the ring and the cut out acetate images are pressed into the resin in the oval ring. More resin is added and the piece is set under the UV light for 10-20 minutes. A second application of resin is added to form a dome and the pendant placed again under the light. 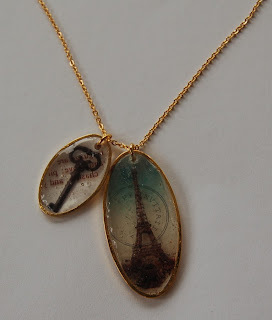 Once the resin has hardened the tape can be removed and more resin added to the back of the pendant. After curing the pendant under the UV light again, the bead is removed to form a hole for the jump ring. 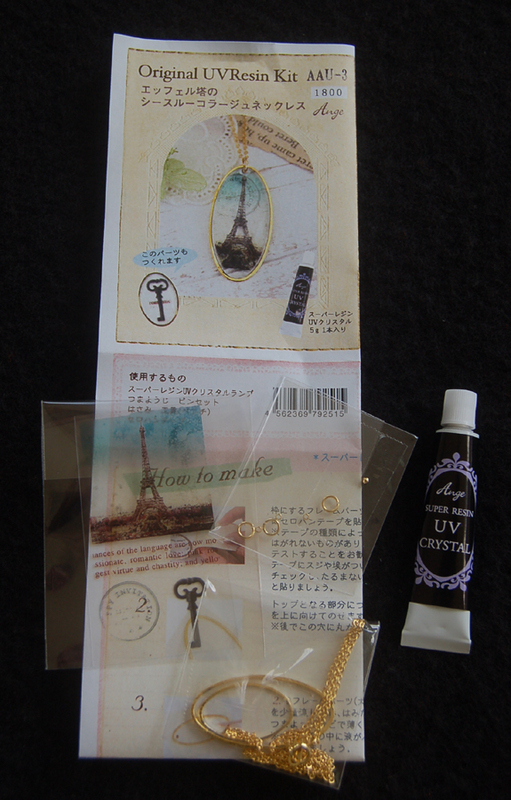 Here are other supplies which are needed or will be useful to make the pendants. The bamboo skewer was used to spread the resin and position the acetate pieces/bead. The large needle was helpful to remove the bead and/or widen the pendant hole. The resin is a bit oily and sticky so I found that Clorox disinfectant wipes are excellent for cleaning hands and tools. This new jewelry craft has many applications and possibilities. 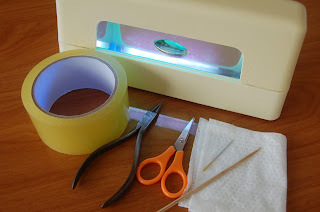 I think you will be thrilled with what you can create this UV resin. 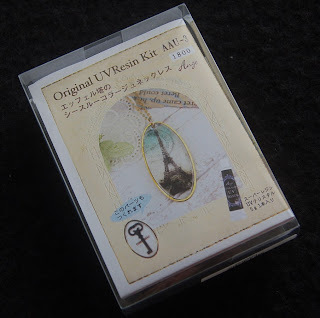 Please visit this blog site again to see more UV resin creations. Sometimes there are friends with whom I don't exchange birthday gifts but who deserve to have their special day acknowledged with a pretty card and a little something. 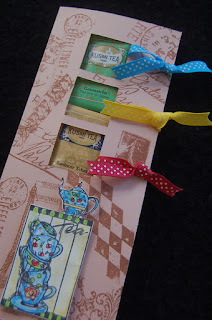 I think these tea folder cards are the perfect solution. 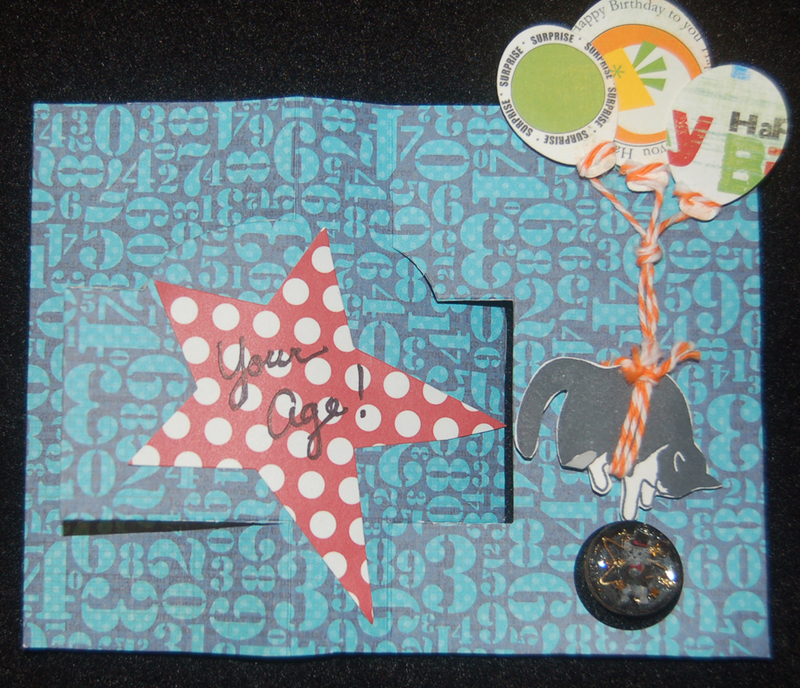 I started with the three-window, long card that was die cut with the Sizzix Big Pro die. (Read the last post for more information.) Notice that the movable windows can be positioned in various places on the card. It was simple work to stamp all over the folder cards with images from a Tim Holtz stamp set. The cat image is a Hanko stamp and the others are from my oldies but goodies stamp stash. The tea bag packets were adhered with Merikan double stick tape. 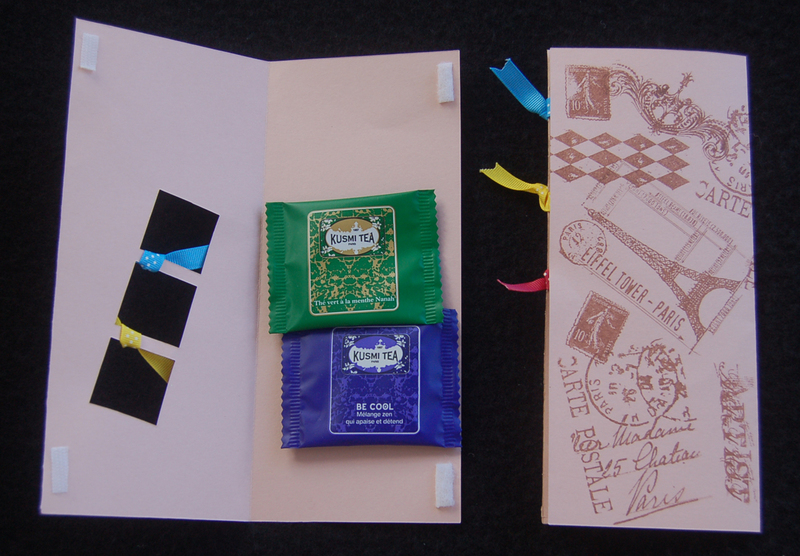 The inside of the card has room for a message/sentiment so you can adapt a tea folder card to many occasions. I couldn't find my Velcro dots so I had to make a closure with little pieces of Velcro strips (usually used for sewing projects). 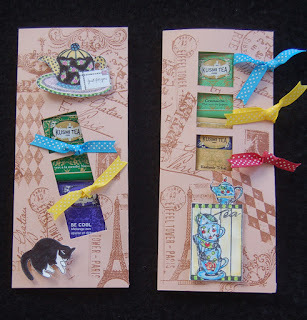 The windows of the card allow for embellishing by simply tying on ribbons. 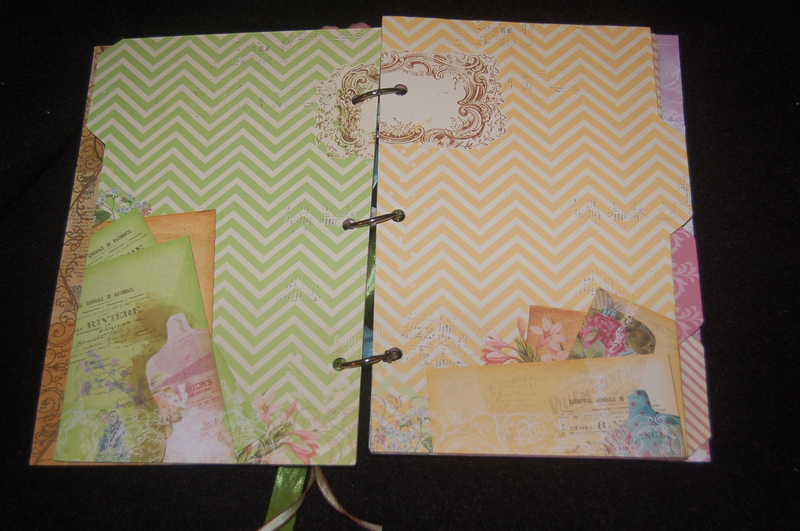 The dotted grosgrain ribbons are from a large, multicolored packaged set sold at Ben Franklin Crafts. Tea drinking is growing in popularity so I know many of your friends will appreciate receiving a tea folder card. I think you'll have fun making some for them. Thank you for stopping to read this post. I hope it has been enjoyable and informative. Please leave a comment if you have the time. I love hearing from you!